Push anything to your Android device. At the recently held Google Event, where the new Nexus 7 was unveiled, Google announced that the Play Store was now the officially biggest App market. That being said, it’s not a surprise to find innovative and better sharing Apps, like Bump! or SuperBeam. Just like them, PushBullet is one of the most productive and innovative App that I’ve ever come across. It pushes anything from any device, that supports web browsing, to your Android Device. You can push any file, image, video or even a list to your Android device. The biggest plus one goes to it’s ability to save the user’s time. It’s pretty quick and appears as a notification on your device. I’ve seen people emailing themselves the required link, and open the mail in their phone. But now, PushBullet can take care of that. No need to send useless mails to yourself. And of course the Chrome extension makes it incredibly easy to push webpages and Google Maps addresses right to your phone. Found a restaurant you want to try out? 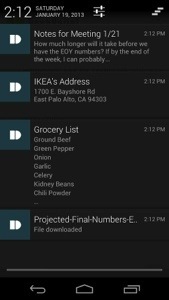 Push the address to your phone and get to navigation in a snap from the notification. This service pushes YouTube videos, or Notes as desired, and thus it’s a Chromecast-like feature for your Android device. For accessing the service in a non-Chrome browser, just visit PushBullet.com and register yourself, using your Google account. Thus, you can push anything from iPad, Kindle and even from one Android phone to another. This service is quite useful who use Android Ecosystem only. Want to transfer data from iDevice to an Android device? Check out my previous post.